Over the past few days, I have been thinking of a wide variety of topics that I might consider today: the recent run of bad contemporary poetry books (or perhaps my own irascibility), the fact that today marks the one year anniversary of the combined Beneath Cherry Blossoms and Issa's Untidy Hut blogs, the war etc., along with a few others. Did I mention the paucity of good contemporary poetry books (or at least ones I've run into)? Unfortunately, my topic found me. When I opened yesterday's mail first thing this morning, I learned of the death of artist/poet John Harter. 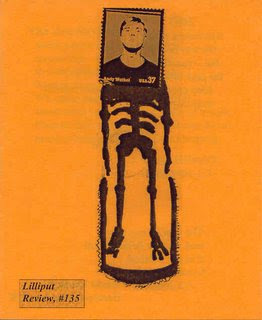 John was a longtime contributor to Lilliput, of both poetry and art. John's work first appeared in LR #98, back in July 1998, ten years ago this month. The cover above is for #163, one of the two current issues just getting ready to go out in the mail. Once again you may see that the artwork is part of the envelope, this time the Warhol stamp being used for postage is also the head of the drawn skeleton. His words arrested the reader. They made s/he stop and think about the context of things, all things, and how we do and don't fit into that context. Rather than the usual Thursday post from a back issue of Lilliput, I thought I'd highlight a small selection of work, from the over 20 poems John shared with Lillie readers over the years, as a celebration of his life, work and memory. Bear, you're in my thoughts. John, rest in peace, brother. Sorry to hear about John. I haven't been here long enough to familiar with his work, but the material you posted was excellent. Hello, Don. Happy 1st Anniversary. Thank you for introducing me to John Harter. He did indeed leave the light on. "I turn on the light and leave"
to end an issue and thinking, how clever. Now, there is the true mixture of sorrow and joy that makes it resonant deeply. Yes, he left us with the light. Sorry about John. He will definitely be missed. His Buddhist statuary poem made me laugh.